Hey guys I just installed 18x9 weld fronts, not sure of the offset but I believe they are the standard recommended by Weld. Tires installed on them are Nitto 555 255/35/18. I am getting extremely bad rubbing issues when angling onto driveways, it catches the front fender lip when the wheel tries to tuck. I've run both 265/30/19 tires on my HREs and 245/40/18 on other 9" wheels and have never had this problem. The wheel/tires look like they fit well (see pictures below) but rub when the wheel is turned and they try to tuck in. Do I need to step down to a 245/40/18 or smaller tire? Is the top fender bolt out? Top fender bolt is out. It's actually grabbing the metal lip on the fender, I have strips of rubber caught that shaved off from the tire caught inside the fender and the lip is starting to bend. I just put my 265/30/19 HREs back on and they don't sit quite as flush but I don't get this problem. I'm wondering if a smaller sidewall/width tire will help? Is everyone running 255/35/18 on these fronts? With the car on jackstands the wheels poke out quite a bit. Last edited by 051009; 10-24-2015 at 09:05 PM. It's enough to grab the metal fender and shred the rubber when the wheel is turned and trying to tuck. The only way around it is a narrower tire that is stretched or a different offset with a spacer. Welds need a very aggressive offset to fit TT brakes. Get a medium pad and add a 10mm spacer if you want it tucked in more. Not a fan of this fitment, a bit too aggressive for running a proper sized tire. Is the wheel PN 71HB8090A61A? This would be their +28 offset, high pad, and requires no spacer. 3.2L 10:1 VVTi, Plazmaman Intake, PTE6870, AEM Infinity 6, V160 w/ RPS CC, Recaro Cross Sportster CS seats, iForged wheels, BBKs, mint air freshener. Eventually if you keep running those you'll go up a curb and completely catch the fender lip and pull it out. Where did you get the wheels? Bought the wheels used with new tires on them and have already taken a chunk out of the corner of the tire. Swapped the wheels out for the time being until I can figure this out. Not sure of the wheel PN as I bought these used but you are correct, I am running these wheels without the need for a spacer. Edit - I see from the fitment guide they have a note for high pad fitment in the front they recommend rolling the front fender. Last edited by 051009; 10-26-2015 at 05:20 PM. When I ordered my Welds when they were first introduced, they had me run an 18x9 medium pad +56mm with a 20mm spacer to clear the brakes. So thats a +36mm offset. I have a 265/35/18 and don't rub even with the fender liner bolt still in place. I believe that makes sense, my wheels extend an additional 8mm further out than yours. In their fitment guide they are recommending a 13mm spacer for medium pads wheels. That makes sense, 1/2" spacer is about 12.7mm. You need a 245/40 on the +28 18x9 Welds. Or you can raise the car slightly. I ran that setup with no issues. My previous setup -- CCW SP500 19x10 with 265/35 -- rubbed at the same height. * Garrett * Extreme Turbo Systems * Driveshaft Shop * Kelford * Clutch Masters * Manley and many more product lines in stock! Contact us directly for the best pricing and service! Would a 245/35 be too small? It would be a little short. 245/40 would be ideal. Eh, I wouldn't go that small. That size would be smaller than the factory size of 25.3". It will also look stretched and the ride will be more harsh with less sidewall. Just an update in case anyone cares, I switched the tires out for the 245/40/18 everyone was recommending. 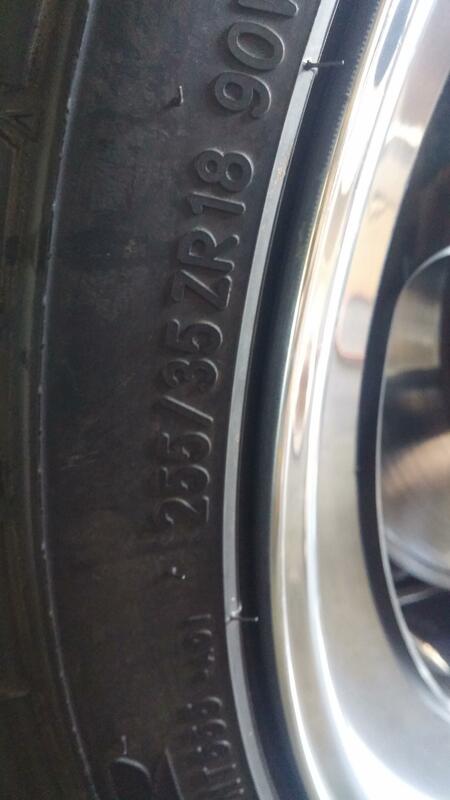 I also confirmed that the part number on the wheels is 71HB9080A61A. The tires now rub even worse than before with the 255/35/18, I believe it is now because the tires are taller but I am now hitting the fenders going over even small bumps in the road. 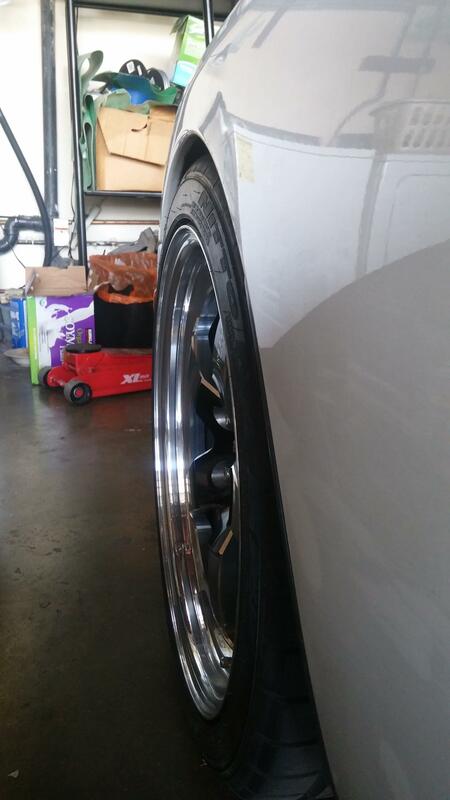 I realized it may be a ride height issue as I was at less than 1 finger gap with the car settled on the ground. The offset on these wheels is simply too aggressive to run an aggressive, low drop without working the front fenders (cut or roll, possibly even a slight pull). I've since raised the front to a 2 finger gap and no longer experience rubbing. The ride height/drop is not what I would consider ideal as I enjoy ideally no wheel gap at all but for the purposes of not hitting the body of the car it will have to do for now. I tested it on some driveways and at certain angles with the wheel turned I come less than 1/2 finger gap away from hitting the fenders so I cannot go any lower with these wheels/tire combination. The 255/35/18 may give me a little more room but not much. 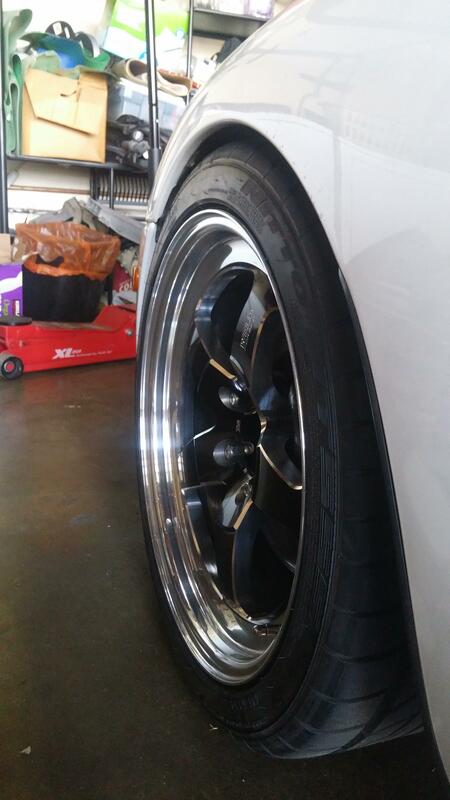 The offset of these wheels definitely do not allow them to tuck into the wheel wells properly without destroying the fenders at my desired ride height. Matt I'm curious when you were running this setup with no issues what was your ride height and how much of a gap were you running in the front? What tire are you running? Every manufacturer will have slight differences in overall height for 245/40/18 tires. They aren't all exactly the same. I agree with your assessment that the offset isn't ideal, but it does work with the right tire and ride height. Tire choice makes a difference. 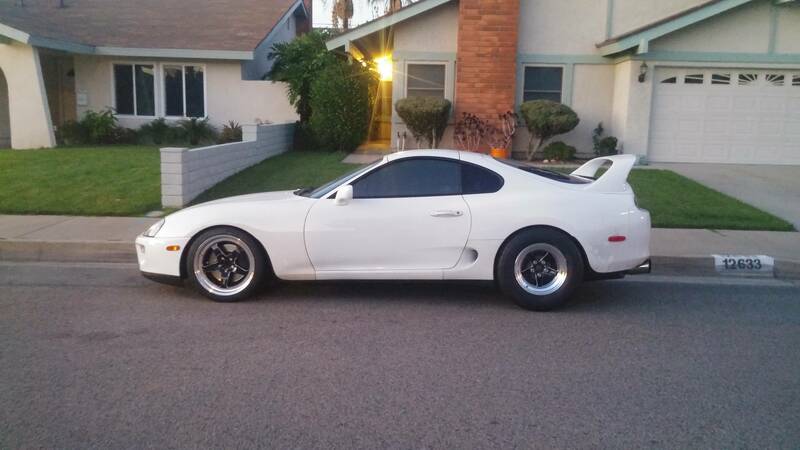 I have Toyo R888 265/35/18 on my Supra and Toyo T1 265/35/18 on the SC300. The T1s are a full inch more narrow than the R888s. True, I hadn't considered that different tire models may have different dimensions. Both the 255/35/18 and 245/40/18 I've tried so far are the same Nitto 555 model tire. I had that exact wheel setup with Michelin Pilot Supersports 245/40 and had no rubbing issues. Suspension was Eibach springs with KYBs. Wish I had seen this thread before. I have the same welds in s77 and the fronts look just like that and will require a 245 as well. Last edited by Casey James; 04-13-2019 at 08:34 PM.